Order Deadline 10am Mon-Fri (all orders placed afterwards will be processed as next working day). The Bosch AHM38G provides a very precise clean cut from it's 5 blade cylinder cutting system. 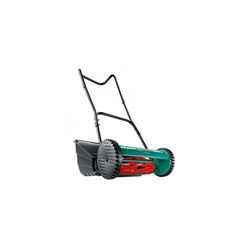 The perfect economical and environmentally friendly way to give your lawn a stylish cut. Please Note This is a kerb side delivery only. If you have any special requirements or believe access to your address may be difficult for our delivery driver please contact us. If a refuge vehicle can gain access then generally our delivery lorry should be able to but if in doubt please get in touch with us. If you feel you may be located in such an area please call to check prior to ordering. Typical delivery is 1/2 working days (please refer to each product for an estimated delivery date, please note this is not a confirmed date). If you are going to be out on the day of delivery, it is possible for the item to be left somewhere (for example down the side of a house) but at your own risk. To do this you must leave a signed note detailing your instructions in a clear location for the driver to see. It is important that you sign the instructions as this will be taken by the courier as proof of delivery. Please note you can discuss this with your delivery scheduler when they call you to book your order in.